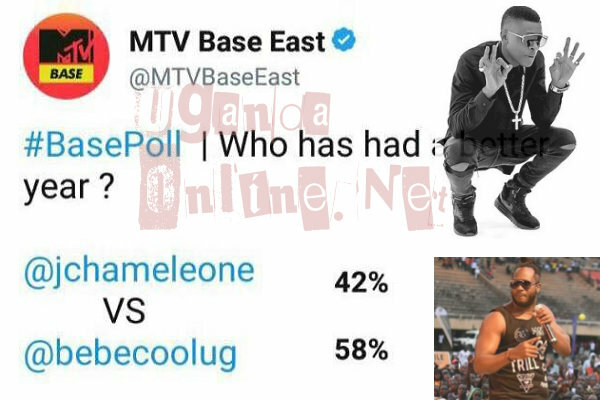 MTV Base created a comparison poll between Bebe Cool and Chameleone on who has had a better year, hours into the poll, the Mbozi Za Malwa crooner was in the lead. This forced Chameleone who is on the last leg of his Australian tour to change color like a chameleon. "Another platform meant to Unify East Africa is failing to learn the logistics of a growing industry and society. What are the scores you look at? You have not been here to defend and sacrifice for the Industry you are quickly and rushing to depend on. I am passionate about East African music! That has earned me miles of excellence,Love and respect from all corners of the region I represent. I hope one day we shall all be carried of value to an industry we have built where vultures want to depend on. Big up all artistes. We are all having good years as long as we are adding value to our Fans, Friends and Families." Chameleone then went on to compare MTV Base with Mseto East Africa and asked his fans to comment on who has had a better year, who is relevant and who should they trash of the two. It's not the first time MTV Base is running these polls. Early this year, they ran a similar poll of Best Video between Platnumz Marry You, Bafana's Cash Cash, Kenzo's Jubilation and Chameleone's Sili Mujawo, Kenzo won. Chameleone wondered why everyone was concetrating on him losing and yet there were other competitors in the poll. "The ultimate way to people's hearts is not through the eyes, but ears and that's why even the blind love and dance to Joseph," He concluded.